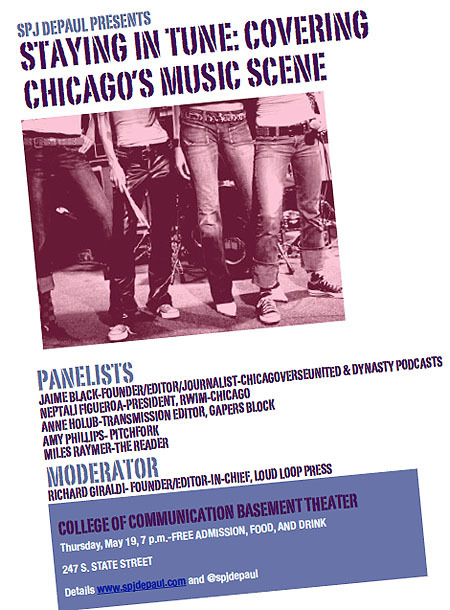 More than 40 students and members of the Chicago music community gathered at DePaul University’s College of Communication on May 19 to explore the ethical issues, impact of technology and the future of covering Chicago’s music scene. The event was live-tweeted using the hashtag #SPJchat. Go to the Twitter page to scroll through tweets from the event to see what panelists said. The event was sponsored by SPJ DePaul, moderated by Richard Giraldi of LoudLoopPress and organized by executive board members Katie Karpowicz and Ali Trumbull. Click on the link below to read panelist bios. Their Twitter accounts: @rgiraldi,@jaimeblack and @izatchu . 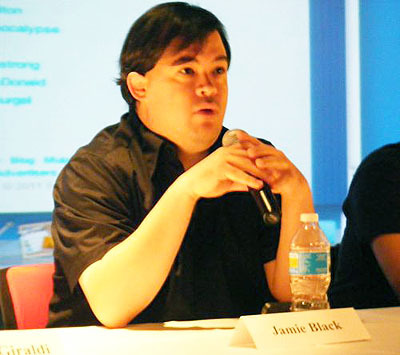 Jaime Black: Black began his career in the music industry at the age of 15 as an intern for Q101. He has served as the producer of Q101’s Chicago music program, Local 101, for over a decade now. In 2005, he launched Dynasty Podcasts, Chicago’s first music podcast series and network. He currently interviews Chicago talent and tastemakers and chronicles the Chicago music culture and community at Chicagoverseunited.com. Richard Giraldi, Moderator-Panelist: Giraldi’s music journalism career began in New Orleans, La. After graduating from Loyola University New Orleans with a bachelor’s degree in journalism, he went on to become a staff writer and editorial assistant for OffBeat Magazine, a prominent Louisiana blues and jazz publication. Giraldi moved to Chicago in 2008 when he was accepted into DePaul University’s M.A. in Journalism program and quickly began freelancing for local entertainment publications including ALARM magazine, Chicago Innerview and TimeOut Chicago. In 2009, Giraldi founded LoudLoopPress.com with web designer Josh Reed with a mission to specifically cover Chicago’s local music scene, and in 2010 Loud Loop Press was voted Best Local Music Blog in the Chicago Reader. In addition to LoudLoopPress.com, Giraldi’s concert and album reviews can occasionally be found in the Chicago Sun-Times. Anne Holub: Holub is the editor of Gapers Block’s music section, Transmission. A Virginia native, she moved to Chicago eight years ago from Montana, where she received a MFA in creative writing from the University of Montana — a graduate degree that has come in handy in her ongoing role as blogger and music critic. She makes great sweet pickles. Amy Phillips: Phillips is the News Editor at Pitchfork Media. She has contributed to The Village Voice, Spin, the Philadelphia Inquirer, Seventeen, and countless other publications. A native of Philadelphia, she currently lives in Logan Square. Neptali Figueroa: Figueroa has been in the Chicago music scene since 2003. He established a boutique management company, Run With It Mgmt (RWIMChicago.com) and has focused on promoting, booking, and developing Chicago artists for regional and national exposure. Through managing, live booking and promoting, Neptali helps Chicago musicians branch out and take a step towards the next plateau of their musical careers.